Here are a few titles that I’ve managed to read lately. I’ve started to hit my summer reading pile, but this week I plan to knock out a bunch of books. I hope you’ve found time to read on your summer breaks! I’ve been wanting to read Wild for a long time and finally was able to get it from the library. It was worth the wait! I am fascinated by real life tales of people coming back from the lowest points of their lives and doing amazing things. I cannot even fathom undertaking something as big as hiking for 3 months mostly by myself, not to mention not having any experience about hiking whatsoever while doing so, at the age of 22! Strayed is very honest and doesn’t shy from any details. She recounts her mother’s death, the disintegration of her family, and her time on the PCT. Great book. Highly recommend. It took me about 50 pages to get into the follow up to Alice in Zombieland, but there was lots of action, teen angst, funny dialogue, and conflict between all of the characters to keep me interested. I’m sure I missed a ton of Alice in Wonderland references, but I look forward to reading #3 when it comes out later this year. The final book of The Grisha Trilogy did not disappoint! I had no clue how this story was going to end, and was so satisfied at how Bardugo decided to wrap things up. I read the second half while waiting at the car dealership, and fought back tears when I read the last page. I will miss the Soldier, Summoner and Saint and if you are looking for an amazing series that is unlike anything else out there, I highly recommend these books. So impressed and hope this one makes it to the big screen! This book was very hard to read. While the writing is good, and reminds me of AS King, the subject matter is so sad and scary that I almost abandoned it. The story is based on Butter, a 17 year old who at the beginning of the book weighs well over 400 lbs. He is a loner and, as you can imagine, his peers are not kind to him. His mother enables his bad eating habits and his father pretty much ignores him. Butter spends his evenings playing the saxophone (very, very well) and talking to Anna, a girl from school who he has a crush on. Butter uses a fake name and persona while talking to Anna and she really likes “JP” even though they have never shared a picture with each other. When an altercation in the cafeteria one day drives Butter to start a website advertising his plans to commit suicide by having “one last meal” things go from bad to horible quickly. A sad story about bullying and friendship that tears your heart in two. It’s officially the first day of summer break and I am so, so excited for the opportunity to unwind and recharge after what seemed like one of the longest school years in the history of school years. I always bring home a box of books to read over the summer and this year is no exception! This time around there is a wide variety – professional development titles, books that have been sitting behind my desk waiting to go into my classroom library (I always read them first) and just for fun – The Harry Potter series! I’ve been wanting to reread it for a few years and recapture the awesomeness that I had when I read it the first time around. While I already have a couple more titles on hold at the library and a few upcoming releases pre ordered, this will be the majority of my summer reading. I didn’t include the HP books in the pictures below, because I need to get a new copy of The Sorcerer’s Stone and we all know what they look like anyway! Here’s a random fun fact that may make you feel old – HP#1 came out in 1997! Wow! I’m not sure what I’ll read first, but I am going to try my hardest to get to as many as I can before August! Happy reading, everyone! Bam! Two weeks of #IMWAYR in a row! Summer is so close and I am back to blogging on a much regular basis. 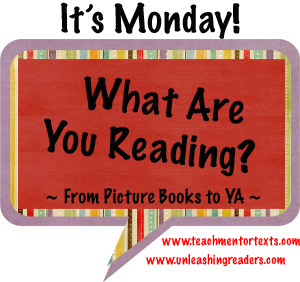 I read a lot of great books this week, so check them out! Please excuse the formatting issues in this post! WordPress and I are apparently not getting along, and I will figure it out before next week. Thanks! I picked up this book at the spring book fair solely on the fact that it takes place in my home state, Wisconsin. I was pleasantly surprised that this book is AWESOME! It takes in the late 1800’s, and there are tons of pigeons nesting in the town of Placid (love that name). Weird, right? The main character Georgie is a sure shot with a rifle and speaks her mind, almost to a fault. Love this main character, the mystery surrounding her sister’s whereabouts and the journey she takes to find her sister. I plan to read this aloud to my students next year for sure!! Two things you should know about me – 1. I don’t like anything zombie related. 2. I have never been a fan of Alice in Wonderland. This is another example of a book I wasn’t expecting to enjoy, but I picked it up because it looked like it had major student appeal. I ended up not being able to put it down and read it in two days! It reminds me a little bit of the Shiver series, but with zombies. While there were a couple lines of cringe worthy dialogue from a teacher’s perspective, this is a great story and will be a hit in my library. I have already requested book #2 from my local library and plan to purchase it before school starts up again. I’ve had mixed feelings about this series. I loved Just One Day and thought Just One Year was just ok, but was very happy that Just One Night wrapped up this series very nicely. It was pretty much the perfect ending that a reader hopes for in a series like this. Good stuff! Well worth the 99 cents. It is with a heavy heart that I include this book in this week’s post, because it means that the series is over. I can’t believe it! I have said before that I never ever thought I would like this series and had the first book in my TBR pile for months. Once I dove in, I could not get enough of Clary, Jace, Simon and the rest of the memorable characters and storyline that Cassandra Clare has masterfully constructed. City of Heavenly Fire is 725 pages long and is 725 pages of awesomeness. Seriously. I plan to write a post on my love for this series very soon. 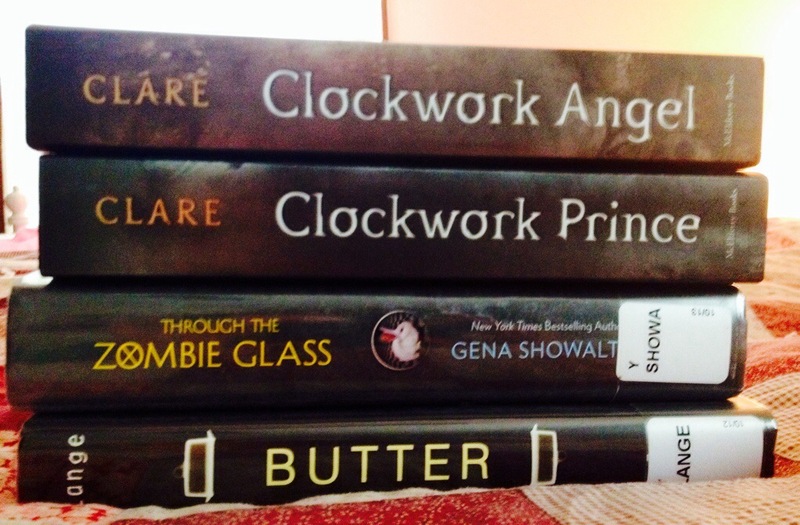 Now that I’m finished with the TMI series, I plan to read the prequel series – The Internal Devices. There are 3 books in the series. 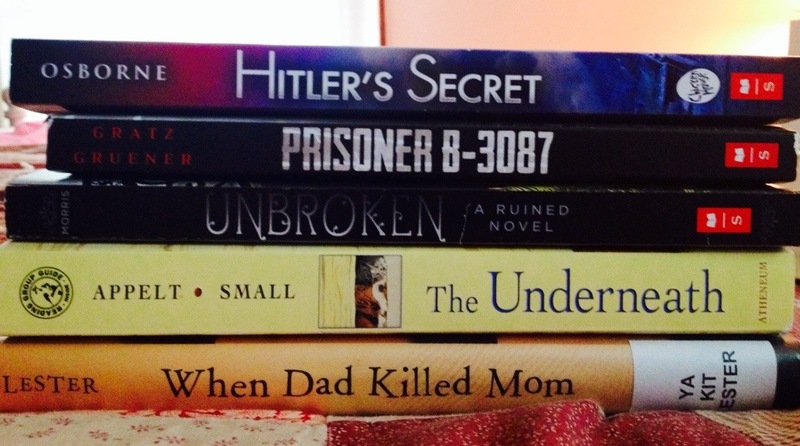 I also have a few books in my summer TBR pile already, and Prisoner B-3087 is one of them. I also hope to pick up Through the Zombie Glass early this week, too.